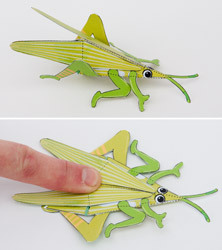 Late stage prototype of a grasshopper snap-up. The whole thing folds completely flat then when released, pops up under elastic band power . Great for use as a book mark! What!? Are you kidding? This looks incredible! I must have this cricket-making power ASAP! Just as the tiny grasshopper can leap the tallest tiger, so the wise man is unable to rub his knees together.